A bald eagle became rogue after the national anthem before the Cotton Bowl on Saturday and landed among college football fans. The bird was released during the Star Spangled Banner for an AT & T stadium in Dallas, but after completing the videos and photos posted on social media, the bird did not return to his before the matchup between number two Handlers back Clemson and No. 3 Notre Dame. 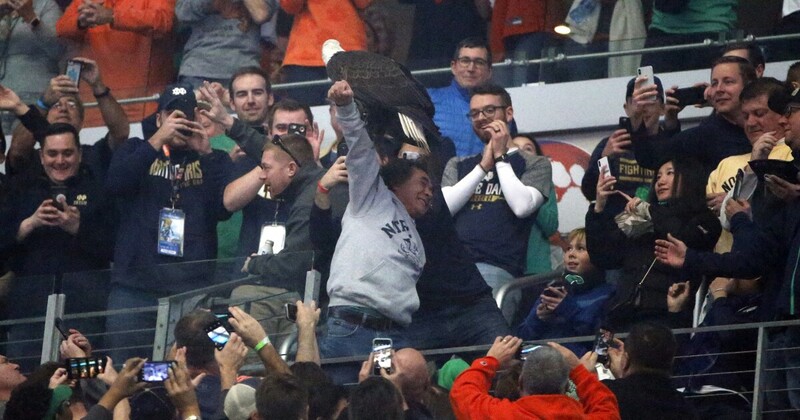 Instead, the trained bird landed on two Notre Dame fans. One of these people, a man in a hooded sweater from Notre Dame, held up the bald eagle on his right arm and cheered on the crowd. According to Pat Forde of Yahoo News, who was present, the bird was soon "caught" by its traders. In a similar incident in major league baseball last spring, the Seattle Mariners tank, James Paxton, had an unexpected guest – a bald eagle – on his shoulder during the national anthem at the home opener of the Minnesota Twins.